A new study measured the height of women’s heels to show that those who move to wealthier cities edit their fashion choices to fit in, but don’t do so if they move to a less affluent area. The findings suggest how fashion seems to embrace two opposite goals—fitting in with the crowd and standing out from it. To examine trends of conformity and individuality, the researchers teamed up with a large-online fashion retailer. 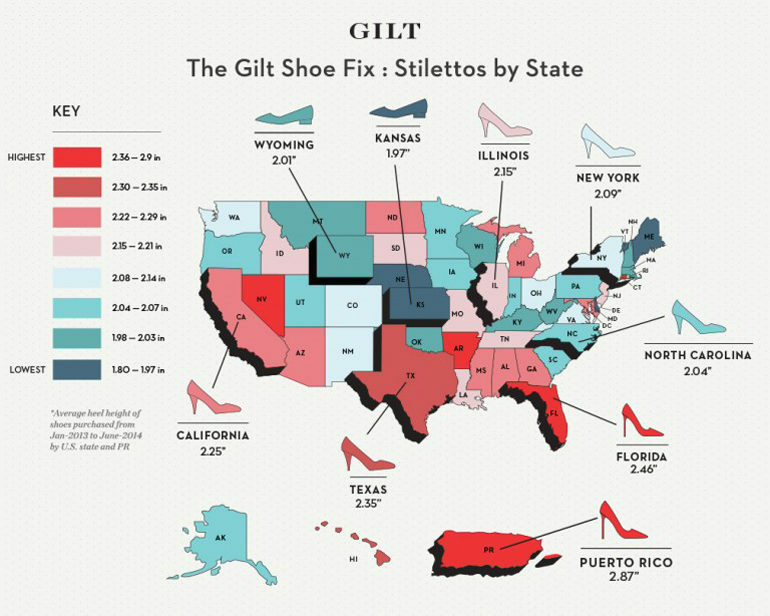 They examined five years of shoe purchases—16,236 in total—of 2007 women who moved between one of 180 US cities. Because fashion choices are hard to quantify, they used a straightforward number: the size of high heels. The work reveals that heel sizes changed when women moved, but not uniformly. When women moved to higher SES zip codes such as New York City or Los Angeles, the heel size closely matched the heel size that other women in that zip code had bought—showing a desire for conformity. But when women moved to lower SES zip codes, the heel size closely matched the heel size of their own past purchase—showing a desire to keep their individuality. The team of researchers label this phenomenon “trickle down conformity,” because fashion preferences trickle down from the top but seldom up from the bottom. “Walmart watches the styles on the runways in Milan, but Milan never watches the styles at Walmart,” explains Kurt Gray, assistant professor of psychology at the University of North Carolina at Chapel Hill. This research builds off the past work of Gray and coauthor Nina Strohminger, published in PLOS ONE, that examined what color combinations make outfits the most fashionable. “We often think of fashion as something frivolous, but it’s an industry worth $1.7 trillion annually, and clothing often helps define ourselves,” says Gray. Collaborators on the research are from Carnegie Mellon University and Yale.